For those readers of this site who may be contemplating a return to the fold, I offer a brief course intended to smooth your transition. You may have forgotten what it takes to be a good Christian, so I am here to help you brush up on three very basic principles, the three strands of our brief course which I call Self-Deception 101. The idea for this course comes from a recent Christian visitor to this site who actually used all three of these basic precepts within a very brief span of time in his comments. So, if you happened to read his comments and paid close attention, then you may qualify for advance placement credit. 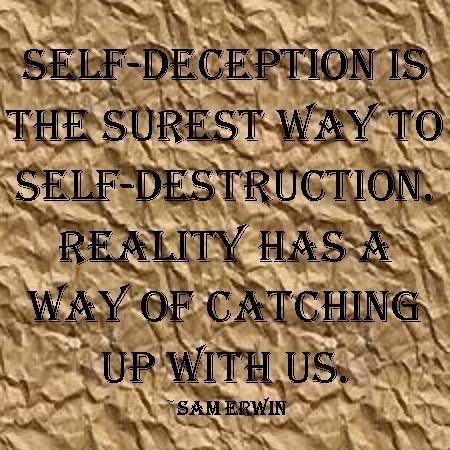 The three basic principles of self-deception are these: 1) Testing god offends him, 2) You must always TRY to believe in Christian dogma, and 3) Much of Christian dogma is above human reason. Now, let’s expand on each of these time-honored and well-proven principles of Christian faith. But, first, we should recognize that all three basic principles underpin all other religions, as well; they are by no means exclusive to Christianity and will all stand you in good stead should you decide at some later date to pursue a different religion. 1) Testing god offends him. This rule is discussed in an article by the apologist Ron Julian at http://msc.gutenberg.edu/2001/02/testing-god/ “Is God doing right by me? … That we ask such questions is not surprising; in fact, the Bible tells us that our troubles are intended to raise such questions. God has an agenda for His people, and high on the list is His intention that each of us confront the issue of God’s character.” But, clearly, we are to accept that character as it appears in the Bible. We are to read that god aided the Israelites in destroying the Canaanites and all other tribes which had taken up residence in the holy land during the Jews absence, but accept that he loves humanity. And, it is hard to see how praying to god is not somehow testing god. Is the god of the Bible the real god? Well, since we are forbidden from running any kind of test, we must accept the word of those anonymous ancient scribes who wrote the Bible. So, testing god offends him. Granted, this is a bit like my being offended when the bank asks for positive identification before giving me a loan, but good Christians must learn to accept. 2) You must always TRY to believe in Christian dogma. The three basic principles of self-deception are these: 1) Testing god offends him, 2) You must always TRY to believe in Christian dogma, and 3) Much of Christian dogma is above human reason. The Bible and apologists tell us we must be open to the message; we must try to believe. Now, some might argue that this is a de facto introduction of confirmation bias into the equation of belief, but the Christian will argue that that’s not a problem if what you’re trying to believe is true. Now that sounds reasonable, and, after all, while the evidence alone will lead us to belief in electricity, or gravity, or love, the story of Jesus is a little more complicated, so it takes more effort to believe it. They assure us, however, that our effort will be amply rewarded. 3) Much of Christian dogma is above human reason. The Bible and apologists are fond of reminding us that god is the supreme intelligence, the intelligence which underlies and sustains all creation, and that we shouldn’t expect to understand everything god understands. Yes, the trinity is a mind-bending concept which is beyond human understanding. And, yes, the human mind is grievously challenged to understand why a just, compassionate, and loving god would create a torture facility for those who won’t or can’t believe in him. But, god understands and will make it all clear to us after we die. It does seem strange, though, that god is so super smart, yet he can’t make things clear to us. Okay, there is perhaps an outside chance that what seems silly in Christian dogma really is just silly, and that the authorities are just trying to sneak stuff past us by convincing us we’re stupid. But, shouldn’t we have already learned those first two principles by now, that god is offended by testing, and we must always TRY to believe? Now, I don’t pretend that these three principles are all you need to know to be a good Christian, but I do believe that there is no better training in the self-deception required to be a good Christian than you’ve gotten right here in this modest course. If you have read this far, and understood and believed, then Christianity may be just the thing for you. Good luck with that.